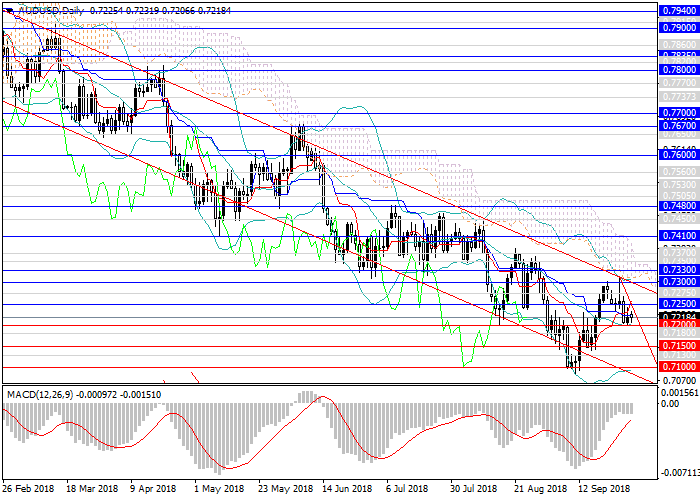 At the beginning of the year, the pair AUD/USD consolidated within the long-term downward trend. In September, an upward wave formed, which, by the end of the month, came close to the upper limit of the range, but could not break it and fell to the level of 0.7200. The main catalysts for the movement remain strong US fundamental statistics and strong demand for USD, as well as a decline of AUD. At the beginning of this week, there is a lack of key releases that can affect the dynamics of the pair in the economic calendar. In the middle and the end of the week, traders’ attention should be paid to the data on the labor market and production orders of the United States. In Australia, data on retail sales and key indices will be published. In the medium term, the price is expected to fall to the local minimum of the beginning of September at 0.7100. In the future, the pair can break it and fall to the level of 0.7050 or reverse to sideways consolidation. Long-term goals can be the levels of 0.6905 and 0.6790: with such a strong impulse, the instrument can test them this year. Technical indicators confirm the forecast, MACD volumes of short positions are growing rapidly, Bollinger bands are directed downwards. Resistance levels: 0.7250, 0.7275, 0.7330, 0.7350, 0.7370, 0. 7410, 0.7480. Support levels: 0.7200, 0.7180, 0.7150, 0.7130, 0.7100, 0.7050, 0.7030, 0.6905, 0.6790. It is relevant to increase the volumes of short positions from the current level with the targets at 0.7100, 0.7050 and stop loss 0.7320.